Game Day is this Saturday, 05 December! Team Phoenix is looking forward to running their third annual mini-build game. Team members will have a chance to compete against one another in this year's challenge, Road Rage! Our robot is almost finished, and our coding subteam is in the process of testing their code. All team members will have a chance to drive the robot on Saturday! Training is in full swing, and Team 2342 is working to build a robot for 2016's mini-build game, Road Rage. From saving "ducks" to pelting a target with dodgeballs, the game is sure to be a blast. The Mechanical subteam has finished building the drive train for the robot, and is in the process of fabricating other components of the robot at this point. The Electrical subteam is wiring the control board, and is also working on a side project titled "Project Mech Phoenix." Headed by Michael Sweeney and Eric Christiansen, the project involves building an adjustable 'suit of armor' for this year's FRC game, Stronghold. The coding subteam has split into three primary groups (auto, sensors, and teleop) to code for the robot. The 'auto' group has started coding. The Systems subteam is managing the Gantt chart for the mini-build schedule. Our team is on schedule! The Business subteam is reaching out to local companies in order to secure sponsorships for the coming season. Team 2342 will be attending the ribbon cutting for the new Homewood Suites on Exit 1 in Nashua, NH tomorrow! Our robot will be carrying the scissors! Team members will have a chance to speak with representatives from a number of companies in the Nashua Technology park. The FLL tournament is coming soon! On 21 November, 2015, FLL teams from the Greater Nashua Area will come to compete at Daniel Webster College! Come and join us! In the past few weeks, members of Team Phoenix have been hard at work building and maintaining a garden in the center of Nashua. What was once a parking lot for the Unitarian Universalist Church is now a large vegetable garden, specifically planted for the Nashua Soup Kitchen and Shelter. The project is an Eagle Scout service project for one of the team members; many team members, boy scouts, and members of the Church worked on it as well. Work done by Team Phoenix members included removing stumps of trees, building raised beds, planting assorted vegetables, and watering the garden periodically. Team Phoenix brought Recyclone and Spare Parts to ASD's Symposium Promoting the Advancement of Real-World Knowledge. Governor Maggie Hassan made a stop at ASD to learn more about the SPARK Day. She attended Team Phoenix's course on FIRST Robotics, and drove Recyclone: she made a beautiful stack of totes. The governor also signed our robot, Recyclone. Thank you very much, Governor Maggie Hassan, for proclaiming 2015 to be a "year of STEM!" Team 2342 is currently attending the BattleCry event at Worcester Polytechnic Institute. This is a fun, off-season event which WPI has hosted for several years. At BattleCry, team members who were not on the drive team during the regular season have the chance to drive. I'lish Murphy and Eric Christiansen are the drivers for this event: Greg Christiansen is the operator, and Chris Tessier is the human player. Maggie Woolsey, one of the members of the drive team during the regular season, is the drive coach for this event. Team 2342 will continue to operate during the summer, this year. The main foci of the team will be fundraising and training for the upcoming season. Congratulations to our new student leaders! Election Day Is Coming Up! It's election season! Team 2342 will be electing subteam leads on Monday, 18 May. The team will be electing a team lead as well. The team is preparing to go to the Battle Cry event at WPI over Memorial Day Weekend. This event will give anyone on the team a chance to drive the robot, if they wish to do so. The team is very excited to attend this off-season event! It will be a great opportunity to practice driving, and to interact with other teams. Team Phoenix met on Monday, 04 May to discuss their plans for the upcoming season. From fundraising to training, the team covered all of their bases (and whiteboards) at this meeting! Team Phoenix plans to increase the amount of time that they spend on fundraising: the team's average rate of growth from year to year requires additional funds. The team discussed ideas in terms of corporate sponsorships and private donations. The team also brainstormed ideas for fundraising, ranging from pancake breakfasts to custom water bottles. The team is planning to meet during the summer, in order to develop plans for training and the upcoming mini-build season. The team might open up the mini-build competition to other teams as well, in the coming years. This will strengthen the bond between the teams in the area, and it will also foster a spirit of healthy competition. The election for subteam leads will take place on 18 May. Team Phoenix at the World Championship! Team Phoenix performed extremely well this season, and qualified for the FIRST World Championship! Using planes, buses and automobiles, the team made their way to St. Louis. At the Championship, Team Phoenix made their way to the playoffs within the Archimedes Division. As the captains of the seventh seeded alliance, the team members chose teams 4201, 5403, and 3602. Although the alliance was eliminated during the quarterfinals, Team Phoenix performed extremely well this year! Congratulations to the members of our drive team, Maggie Woolsey, John Williams, Ryan Glossop, and Timothy Zumbo on a job well done. We would like to thank all of the students, parents, and mentors who are involved with the team. In addition, we would like to thank our sponsors: every penny counts! We are extremely thankful for your ongoing support! Team 2342 recently competed at the UNH District event on 21 and 22 March! The team took first place in the qualifying rounds, and also made it to the semi-finals. Phoenix Robotics is currently preparing for their next competition at WPI. They are making a few final changes to Recyclone and it's twin, Spare Parts. The team is currently fundraising in order to cover the costs for WPI and other events. From Pizza Mondays to the upcoming Sub Zero fundraiser, there are many ways that you can get involved! Come and join us tomorrow at either Sub Zero store in Nashua between 12 pm and 6 pm to catch up with friends, and enjoy some ice cream which is made to order. We hope to see you there! In the past week, our team has been working on refining current techniques in regards to the robot. The mechanical and wiring subteams have installed and wired the IR sensors. This should enable our team to utilize the complex autonomous mode on a regular basis. The mechanical subteam has also installed small wheels on the back of the robot. The dragger has been removed. The coding subteam has been working tirelessly in order to ensure that the complex autonomous mode is working properly. They have been meeting several times a week in order to test the code as well as the functionality of the robot. Thanks to the business subteam, Team Phoenix's fundraising project is well underway. Pizza Mondays at ASD have been extremely successful. Team Phoenix will be holding a fundraiser at Sub Zero on 28 March, 2015 from 12:00 pm to 6:00 pm. A special thank you to Pizza Hut of Nashua for their generous discount regarding our Pizza Fundraiser. The team is currently in the process of refining the design of the robot. The mechanical subteam is making small changes to the robot, such as building a camera mount. The major changes lie in the coding of the robot. The coding subteam is working hard in order to ensure that complex autonomous mode is working properly. The wiring subteam is working on completing the wiring for the IR sensors. With these sensors, the team should be able to use complex autonomous at competitions. The business subteam is fundraising in order to cover the costs of registration for local and regional events. The team is selling pizza at the Academy for Science and Design on Mondays. In addition, the team will hold a fundraiser at SubZero Ice Cream on 28 March, 2015 from 12:00 pm to 6:00 pm. On 26 February, Team 2342 brought their robot, Recyclone, to Nashua High School South. The robot was accompanied by the team's tool chest, "Jerry", and a variety of other items for the team's pit. The team members made last minute adjustments to Recyclone, and brought the robot to the practice field in order to test the elevator for the last time before qualification matches began. Team 2342 performed well in the qualification matches. 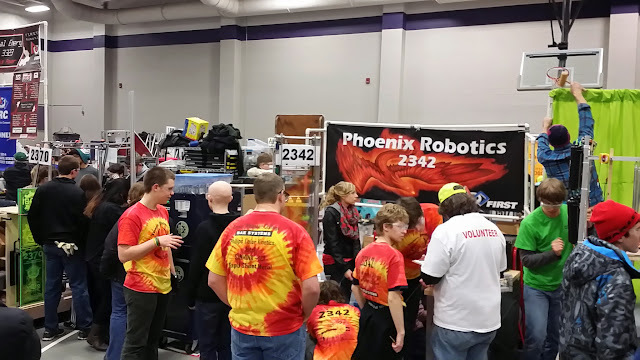 From the driving expertise of the members of the drive team (Maggie Woolsey, John Williams, Ryan Glossop, and Tim Zumbo) to the coding expertise of the coding subteam, the contributions of the team members resulted in the success of Team Phoenix during the qualification rounds. Connor Tess's noodle throwing prowess helped to push the team over the edge: team Phoenix came in second place during the qualification rounds. When it came time to select alliance partners, Team Phoenix chose to work with Team 88, TJ^2 and Team 1512, the Metal Vidsters. The alliance performed very well during the quarter-finals. Team Phoenix and TJ^2 had robots which could form stacks of totes very quickly. The Metal Vidsters specialized in picking up round containers: they capped the stacks of totes with round bins in order to earn more points. During the semi-finals, Team 2342 experienced a malfunction in the drive train. This resulted in the team being eliminated after the semi-finals. However, the alliance performed admirably, even with a broken wheel on Recyclone for one of the matches. The team performed better than they ever had before in this year's Granite State District Event. They hope to improve upon their code and robot design in order to accomplish even more in the UNH District Event (20 March-22 March). Team 2342 would like to congratulate Team 1519, Mechanical Mayhem, for their exemplary performance in this year's Granite State District Event! Ready to go at our 1st competition! The Build Season Is Over! The build season is officially over for Team 2342. The construction of Robot Beta is complete. On Tuesday, 17 February, the team finished building Robot Beta, now named Recyclone. After this, they bagged and tagged the robot. The members of all of the subteams worked very hard to ensure that the robot was finished on time. The coding subteam is continuing their testing work using Robot Alpha-Gamma (now referred to as "Spare Parts"). The coding for the autonomous period is partially complete. The coding subteam has determined that "simple autonomous" mode is effective. They will continue to work on the coding for the "complex autonomous" mode. 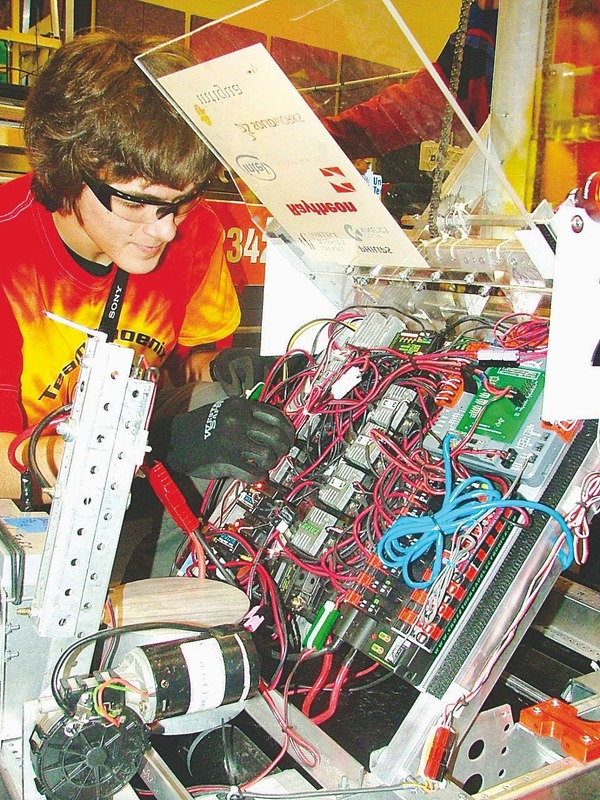 Although the mechanical and wiring subteams built the robot, the coding subteam also played an integral part in "building" the functional robot. Without effective code, the robot would essentially be unusable. While the mechanical, wiring, and coding subteams worked on the robot, the business subteam continued to edit the Chairman's essay and video. The deadline for submissions for the Chairman's award was 19 February, 2015 at 12:00 pm. The members of the business subteam edited the video and essay extensively in order to ensure that they were ready for submission. The art subteam of the business subteam has been sewing the costume for Team Phoenix. They have been cutting and sewing a multitude of feathers onto the headpiece and shoulders of the mascot costume. Thanks to the artists on the team for turning a STEM oriented group into a STEAM oriented one! The members of Team 2342 will continue to meet in the next few weeks. The Granite State District Event will take place on 27 and 28 February at Nashua High School South. In the past month, Team Phoenix has been working hard in order to ensure that the first robot was completed on time. Nicknamed Robot Beta, the team's first robot with a metal attachment is nearly complete, and is functioning properly. The team has been building their second robot, nicknamed Robot Alpha/Gamma. This robot initially had a wooden test attachment. The team is currently in the process of building a second metal attachment, which will be attached to the drive train of Robot Alpha. Both Robot Beta and Robot Gamma will be physically identical if all goes well. The metal attachments are slightly different from the original wooden test attachment, but essentially function the same way. Metal hooks are used to lift the recycling totes and stack them. On the metal attachments, there are more hooks to lift each tote. The metal attachments can stack four totes, while the wooden attachment could stack three. The mechanical, wiring, and coding subteams have been hard at work during the past few weeks. The mechanical subteam has been responsible for the majority of the physical building of the robot. The wiring subteam has been working with the mechanical subteam in order to ensure that the electrical portion of the robot is working properly. The coding subteam has been testing the first robot, and will continue to test and modify their code for the autonomous and teleoperated periods of the match. On 11 February, a handful of the members of Team 2342 taught a class at the Academy for Science and Design's SPARK Day. Students in grades 7-12 learned about FIRST Robotics, and what it means to be a part of an FRC team. They had the chance to learn about this year's challenge. The team also brought Robot Alpha to ASD on Wednesday. Students had the chance to drive the robot and stack recycling totes, just as Robot Beta and Robot Gamma will do in the competition on 27 February. Team 2342 is in the process of constructing both the first and second robots. The first robot will soon be complete. The mechanical subteam is almost finished with the first metal attachment. They have completed the test attachment, which was made out of wood. The mechanical subteam is also working on the second robot (which will also have a metal attachment). The first dragger has been built and mounted on the first robot. The construction of the second attachment will commence today. As with any team, one of the greatest challenges of the season lies not in creating the robot itself, but in testing the robot. The coding subteam has been testing the robot as well as the code for the robot. The code for the attachment is complete: however, the code for the robot is not yet finished. They will continue to test both the robot and the code. The wiring subteam will also be involved in the testing: if something within the control panel malfunctions, the wiring subteam will fix it. This year, the team planned to have completed at least one robot before the build season was complete, in order to allow more time for testing. In previous years, there was much less time for the coding subteam to test the robot. Due to the large size of the team, tasks can be completed in a quicker manner. Team 2342 has almost completed their first robot! The robot is scheduled to be finished on 02 February, in order to allow plenty of time for testing. The team will continue to work on a second robot as well. All of the subteams have put in quite a lot of work in order to ensure that the robot is completed on time. In the past week, the mechanical subteam has been building and assembling the attachment for the first robot. This attachment is an elevator which possesses the ability to pick up and stack recycling totes. Last week, the team demonstrated that the attachment was effective. The dragger has been built, and is scheduled to be mounted on the robot tomorrow. The coding subteam has been altering the code for the robot, and has been testing the robot as well. The coding subteam played a large role in determining whether or not the attachment worked. The coding subteam is currently in the process of testing the code for the attachment. The construction of the second robot is underway! The entire second robot is scheduled to be finished by 09 February. In the past week, the second drive train has been assembled. The wiring subteam has completed the second control panel. In the next few weeks, the team will build and mount the second attachment and dragger. After completing the two robots, the coding subteam will continue to test them. The business subteam has been completing essays and the script for the video for the Chairman's Award. They plan to film the video in the next few weeks. The mascot costume is being sewn as we speak! The members of the business subteam have completed the wings of the Phoenix mascot, and will work on the pants in the coming weeks! Team 2342 is currently in the process of building the robot for the build season. The maneuverable robot was designed so that it could stack recycling totes effectively. The team plans to construct two robots during the season: one will have a lift which is made out of wood, while the other will be made of metal. The two robots will function in exactly the same way. The wiring subteam has finished building and wiring the control panel. The control panel has also been mounted. The attachment for the robot has been designed, and the mechanical subteam is in the process of constructing it. A test attachment has already been built and mounted. In the past week, the coding subteam has finished the code for the robot. Coding will be responsible for most of the testing of the robot. The team will continue to build the attachment and dragger (to drag totes) for the robot in the next week. The construction of the second robot has already begun! In the past ten days, Team Phoenix has made quite a lot of progress in terms of the robot. From brainstorming to building, the team has been hard at work. All of the subteams have been busy developing different components of the robot: the business subteam has been preparing to compete for the Chairman's award. The team decided to build a robot which specialized in moving and stacking the totes. The robot is tall, and is likely to reach the upper limit for robot height. It has an attachment which utilizes a hook and belt. The hooks were designed to fit under the lip of the plastic tote, so that it could be easily lifted. The attachment has the ability to pick up and stack four totes at a time. The wiring subteam has been working on wiring and mounting the control board for the robot. In addition working on the code for the robot, Coding has been assisting mech. They helped to assemble the chassis of the robot. The business subteam has been writing essays and is in the process of filming a video for the Chairman's award. The Build Season is Underway! On Saturday, 03 January, 2015, FIRST released information about the game for this season. The build season has begun! After a weekend of brainstorming, Team Phoenix has developed two main ideas in regards to the robot. The strategy surrounding the robot designs will enable the team to score as many points as possible, while focusing their resources on a few of the main aspects of the challenge. The team has narrowed down its options, and is currently prototyping the robot. One design utilizes a hook and elevator: the other makes use of an arm and an elevator. The team plans to focus on stacking the totes using a circulating belt. This will enable the team to score as many points as possible by stacking the totes. The team plans to finish prototyping by Friday. After the prototyping is complete, the construction of the robot will begin!